Taking on a nanny role requires exceptional commitment and an understanding of the emotional needs of today’s children. As part of their work, it’s important that nannies build their relationship with their employers and create a foundation that ensures effective caregiver performance over many years. 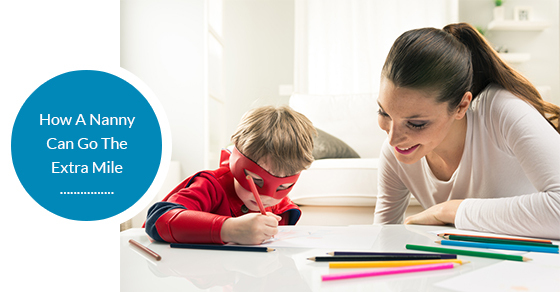 Within this post, we’ll look at how a nanny can go the extra mile within their work. While most children are concerned about the here and now and the events taking place on the day, it’s imperative that nannies understand that building a relationship with the child is a long-term process. Nannies must learn to understand the child’s habits and how to communicate effectively with the child and their parents to ensure that any issues are resolved at the first available opportunity. This helps form the optimal foundation for the future. As part of their working process, it’s imperative that nannies speak with their employers about written performance review opportunities. These performance reviews can help guide the care process moving forward, and can act as an opportunity for the two parties to come together to discuss any concurrent issues that might harm the working relationship. Getting feedback on their performance also provides nannies with an understanding on the client’s current level of expectation and whether these levels are being met. By being able to measure your progress and improvement, this will also be helpful for future discussions for financial growth. At each stage of the caregiver process, nannies should continually ask questions of their employers. Questions could be related to the child’s behavior, or they could be related to the working environment and issues such as scheduling, discipline, behavioral issues and more. By asking questions and creating an open dialogue with the client, nannies can achieve clarity on any confusing elements of their working role. It’s a rule that we dictate to children often, but rarely do we treat others the way we ourselves wish to be treated in our day-to-day lives. It’s a simple rule, but by being respectful to clients and clients’ children, nannies can achieve an exceptional working relationship with the two groups and gain a reputation for being highly attuned to the needs of children and their families. By following these simple pieces of advice, nannies across the country can maximize their job performance and achieve a fulfilling role within the client’s home. To learn more, contact our trusted experts directly!